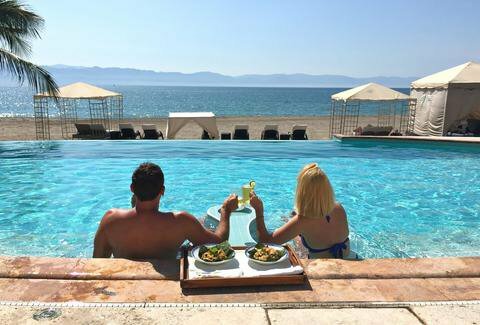 One of the great things about a world-renowned resort like Puerto Vallarta and the remarkable towns around the Banderas Bay are the number of choice resorts, hotels, B&B’s, Air BnB’s you have to choose from. From inclusive to exclusive, from 5-star to hostel, you will find just the place, just the spot, just the price and just the amenities you are looking for. Even though your vacation fantasy is saying Puerto Vallarta, remember the entire bay. Every spot is spot-on to deliver the best vacation you have ever had. Each town on the Bay has a slightly different vibe and different flavor. Each town has a vibrant market, a killer beach, cool shops and spots and great places to stay and eat and explore. So even when you pick one, day trip to some of the others. There is one thing we know for sure. No one comes to Puerto Vallarta and the Banderas Bay once. Ever since the torrid romance of Elizabeth Taylor and Richard Burton made P.V. famous, it has grown ever more so and with good reasons. Perfect weather, wonderful people, great food, warm rolling ocean and every sensory delight you could wish for. You’re going to love every minute except for the moment you leave.